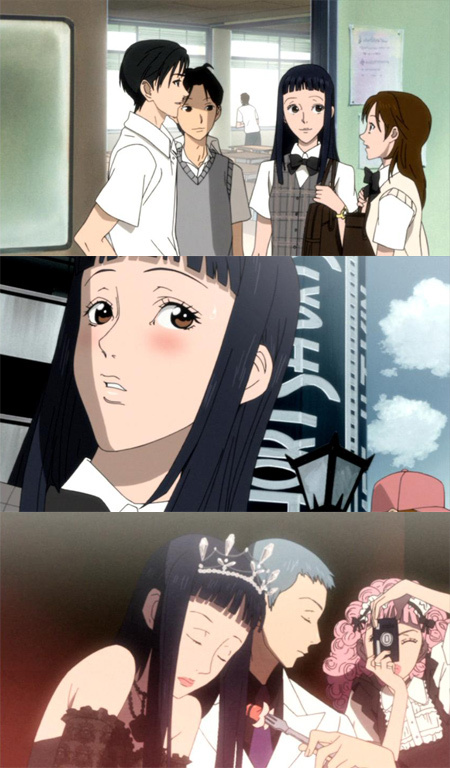 Ai Yazawa’s Paradise Kiss follows Yukari Hayasaka’s tumultuous life of balancing high school and cram school in order to get into a good college to please her overbearing mother. The young Japanese girl has little happiness beyond a stolen moment captured by her camera on a field trip with fellow classmate Hiroyuki Tokumori. 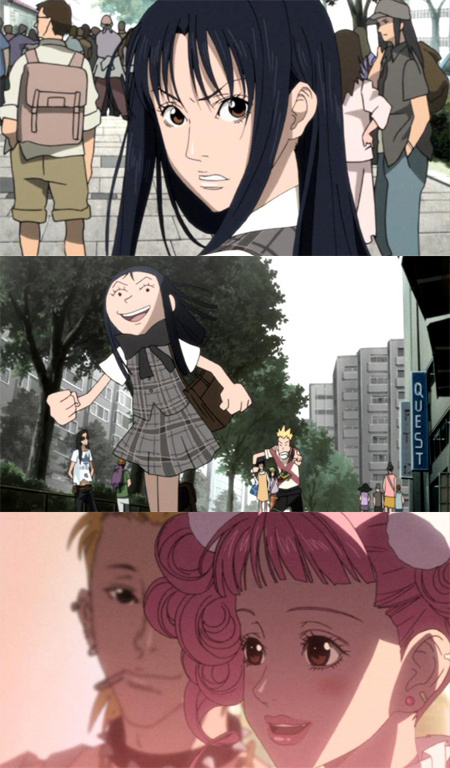 However, everything in life can and will change in an instant when a few students from the Yazawa School of Design happen to notice this troubled girl rushing through a busy crowd on the street. Featuring character designs by Yuki Nobuteru (The Vision of Escaflowne, Heat Guy J) and popular J-drama actress Yu Yamada in her first seiyuu role, Paradise Kiss: Volume 1 takes us into the world of Japanese fashion design and how to cut your own path in life. Notes: Review is based on a Screener copy of the final product. Preview audio clips are available. Yukari was simply walking along the busy sidewalk when a voice called out from behind. Chasing after her was an odd fellow who dressed like a punk rocker and said she was just what he was look for. So, of course, Yukari runs away and right into an amazon in a dress not that much further away. Quickly realizing that the two odd people are together, Yukari faints into the amazon’s arms. When she awakes, a pink-haired angel with curly hair is hovering over her as the former two odd ducks stare from the corner of the room. Is this hell? No, it’s a club for fashion students. The trio are students at the Yazawa School of Design and they need Yukari to model their work in a fashion show. OK, maybe this is some twisted version of hell minus the flames and pointy sticks. The Yazawa School of Design holds a fashion show competition each year with the best designs getting picked to be featured. George, a prodigy at design, has the honor of designing outfits for the competition and the trio Yukari has already met are assisting him in creating the “Paradise kiss” clothing line by cutting and sewing. Arashi plays in a rock band when he isn’t sewing or ditching class. Pink-haired Miwako is dating Arashi and is the younger sister of a popular fashion designer. Isabella assists them with anything they need, from working to providing a willing ear to listen. With George’s charm and design skills, the Parakiss label has a chance to win the show and launch a brand new line of clothing. The first two episodes explore Yukari’s apprehension to joining the Parakiss club. Between high school and cram school, Yukari is fairly busy studying to get into a good college. Yet, George pursues her with a mixture of gentle and rough explorations of her life as she falls more and more for the handsome designer. Yukari’s growing infatuation from the pursuit starts to confuse her own desires for Hiroyuki Tokumori. Yukari also finds out that Miwako and Arashi used to be good friends with Hiroyuki which makes her split desires even more confusing. Our second set of episodes reveal the various love connections amongst our members. Yukari tricks Hiroyuki into taking a walk with her so that Miwako and Arashi can meet their old friend again. However, the past between Hiroyuki, Miwako, and Arashi is more complicated than old friends who simply grew apart with age. 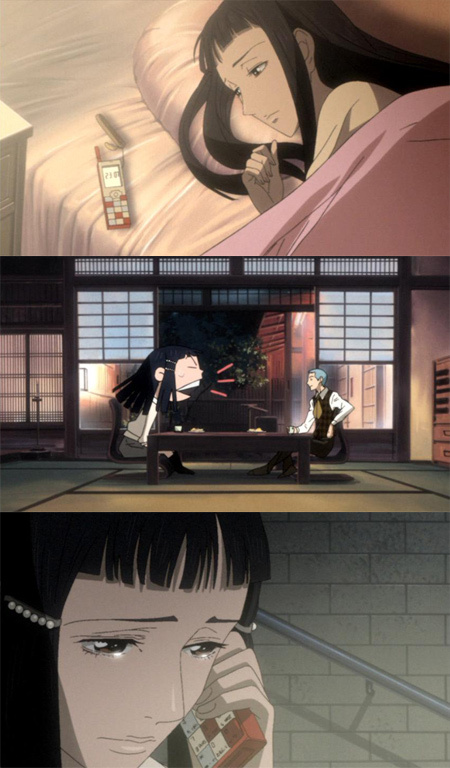 George’s bipolar attitude of being both romantic and harsh to Yukari frustrates their relationship continually as Yukari tries to enter her first real relationship. The tensions between the two crossover as work and play become intertwined and Yukari leans more on the club to give her a chance to do something more interesting than study constantly. 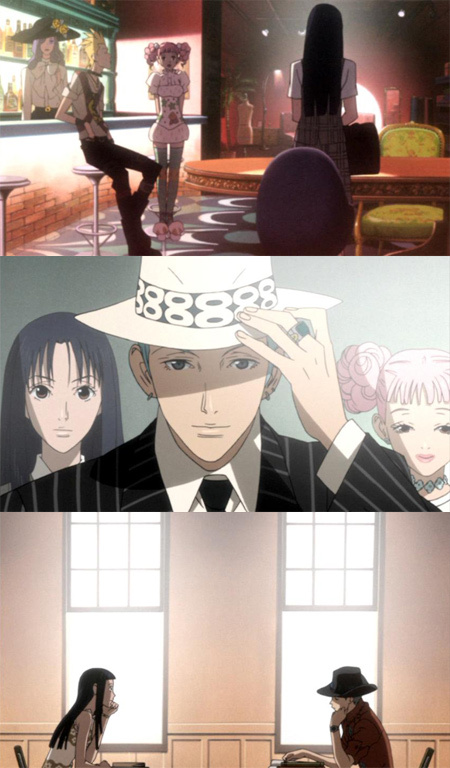 Design is an important aspect within the Paradise Kiss series. 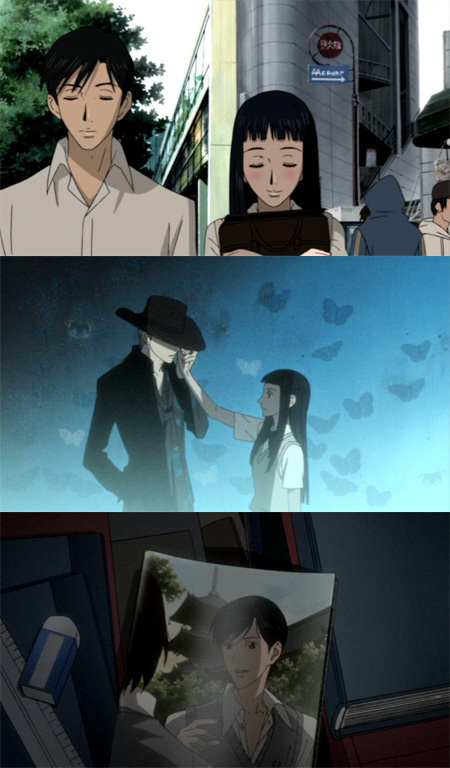 The animation, character designs, and storyline blend various styles together to present the viewer with a unique look into Paradise Kiss. Yuki Nobuteru’s character designs stand out against the mixture of traditional and experimental animation looks of the series. Both seemlessly blend with Ai Yazawa’s original storyline and the slight changes for the 12-episode animation series. The finished look will either intrigue the viewer to continue or push the viewer to look for something else entirely. After all, how many anime series do you know that follow fashion design students? Casting for such a complicated series becomes even more important. Yu Yamada’s first seiyuu role as Yukari is very well done, matching the various mood swings of the character as she debates school, play, and love. Equally well done is Kenji Hamada’s perfomance as George as he entices and denies Yukari constantly. Marika Matsumoto’s Miwako comes off a tad rough the first episode or two before fully settling into the role of a chipper free-spirit. For the American production, Geneon has brought in Bang Zoom! Entertainment with voice actress Stephanie Sheh in her first Voice Director role. Performances are decent, but could use some polish in places to better capture the mood of the characters. Disappointingly, the script tends to waffle between accurate and sketchy from scene to scene. Julie Ann Taylor captures Yukari’s moodiness with ease and is a highlight for the English production. On the other hand, Patrick Seitz’s George doesn’t always capture the right attitude needed and can be a tad softer than needed for the character. There’s still room to improve on the title in both script and direction to make the English dub shine, but this probably wouldn’t be my first stop if I was trying to decide which track to listen to first. Paradise Kiss: Volume 1 is available on its own or with a box. The story of love isn’t new, but the direction with fashion students and a girl trying to decide her own destiny make it worth looking into if you want something different. The video is very clean and no issues were found with the subtitle tracks. The extras include TV commercials, concept art, a press conference with the team behind the show, and an interview session with Yu Yamada. The DVD also includes a bonus preview of the TOKYOPOP release of the manga series when you insert the DVD into a computer. And with the final bonus of the original closing track by Franz Ferdinand being licensed by Geneon, you cannot deny that some effort was put into making a good DVD for fans to enjoy. The show isn’t for everyone, but it’s still something you should check out for yourself. I’m looking forward to seeing where the story goes next when Volume 2 comes out.